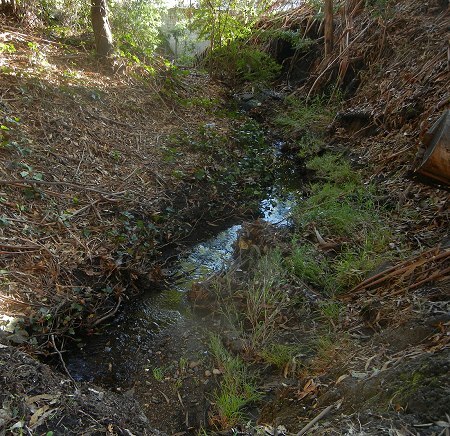 The third creek running through Mills College is Seminary Creek. It gets its name not just from Mills, but from the Beulah Heights district that forms its headwaters. On the 1897 USGS topo map it’s the dashed blue line, signifying an intermittent stream, running due south to East Creek (now named Lion Creek). Nowadays it’s almost entirely culverted. Not only that, it’s been kidnapped! 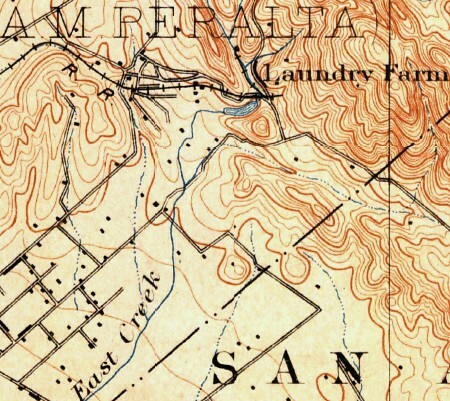 The Oakland Museum of California’s creek map shows the creek as being redirected away from Lion Creek. Today it runs just north of Seminary Avenue to a channel called East Creek Slough. 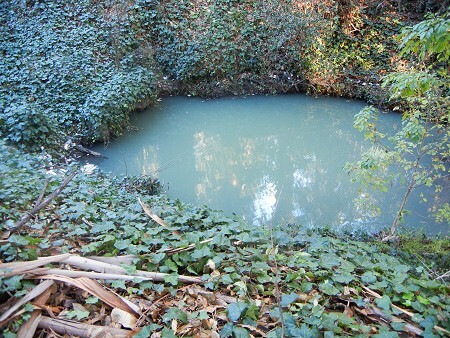 What glory the creek still has today is evident only on the Mills College grounds. It ducks between lobes 6 (Maxwell Park) and 7 (Mills) of the Fan next to MacArthur Boulevard, but a close look at the topography suggests that a landslide or earthquake could easily have made it spill to the east of lobe 7 (past the triangle marked “30” on the stream map). Be all that as it may, the creek daylights just where MacArthur curves west. It then wanders a couple hundred yards through a nice quiet forest, mostly eucalyptus. Other than putting a parking lot over half its course, the college appears to have left Seminary Creek alone. When it hits MacArthur, at 57th Avenue, Seminary Creek disappears. Here’s the last sight of it, from the MacArthur side. Here’s where the stream got kidnapped. I’ve taken photos of the creek farther downstream, but it’s a nondescript ditch and now I feel sorry for it. So I’ll spare you. Interestingly, the old map showed the creek as intermittent, but I’ve never seen it dry even after our three-years drought. 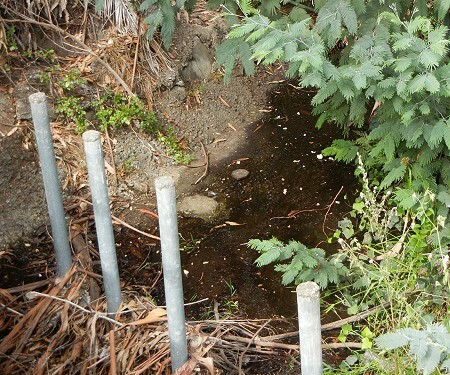 As I mentioned about Chimes Creek, I think undergrounding Seminary Creek has kept it from evaporating. This entry was posted on 14 February 2015 at 5:28 pm and is filed under Oakland streams and water, the Fan. You can follow any responses to this entry through the RSS 2.0 feed. You can skip to the end and leave a response. Pinging is currently not allowed. Thanks Andrew! I love taking friends for walks and acting like a complete know it all! I know I’ve mentioned how the Hayward fault has disturbed the streams that cross it, but I haven’t summarized all the cases in one post. I’m ready to do that when I get around to it. 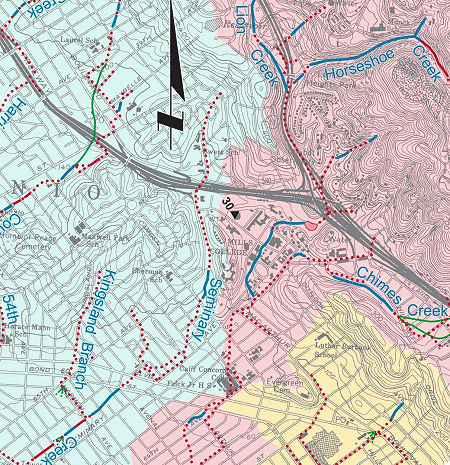 I think that the blueschist exposure was carved during the century that the rail line has run through there. Before that, the little creek would have spilled straight down from Reinhardt/Davenport/Fair Avenues onto the flat where the president’s house is.